“I try to convey my irritation to my family. I don’t know how to express myself. All I want to say is I feel discriminated by them. But it will only lead to a torrent of all the things they have provided for me and all the things I have in my life that I should be thankful. God is never happy with ungrateful children who ignore his blessings is one their usual quote. Usually they discard my feelings and say that I am just stupid to talk in this manner. Most of the time they feel I have no reason to feel unhappy. That leads to anger and then I start throwing tantrums. I can’t help it. I can’t handle it in any other way. When I am throwing a tantrum at I get to talk out loud whatever I want for sometime and that helps ease the frustration building up in me in some way. One bad day I just wouldn’t stop with a simple tantrum and all of a sudden a thought came over in my mind that may be I was not their kid. I asked my mom whether I was her child or not and she said “Now who ever has heard anything sillier than this?”. I was sort of very irritated that particular day and went on asking whether I was their child or not. All this started with a breakfast of chapatti. I was very angry because my mother gave the first chapatti to my sister though I was there waiting for it in the first place. I got up earlier, got myself ready for school on my own when she was getting ready yet with all the fuss and help from my grandma. I hate being late to school. Because of my mother I have to run all the way to the bus stop at times. I find it so difficult to run with the school bag. My leg troubles me. My mother doesn’t understand this. I can’t say that my leg troubles me. I never say that. I feel as though I will be confessing to being inferior if I ever do that. Now ‘that question’ they all said was very bad and my grandmother said I was very ungrateful bad girl. I do not understand why a child is considered bad if they just express any doubt that comes into their mind. I sort of can’t speak what is coming in my mind without being scolded for being bad. So I don’t talk much to the people who do not understand me. I just learnt to use water colors to paint and our physical trainer who is an wonderful artist is guiding me. I did quite few good paintings. I stood first in drawing competitions and many other events last year”. Yes. My grandmother gave me big list of things that my mother and others have done for me. She says there has been a lot of a sacrifice done for my sake from my family. I was getting late to school and so I left fuming with anger without eating my breakfast. I could not concentrate properly in my class. My anger was almost burning me and I must have behaved very odd in my class. My teacher who always found me intently listening to every word she said must have got worried and I was sent away to the hospital nearby with another teacher to get my temperature checked .. ha ha ha. I do not understand what got the teacher so much worried though. I have been upset earlier too but never has that been visible. I tried my best to concentrate on the notes the teacher was writing down on the board and could not wait to get back home as soon as possible so that I could bring the matter up and get few things set in their place. At least you asked, I never thought to ask, perhaps I didn't want to hear the answer. Good grief I can totally understand the insecurity in the child. ... we always wanted to please others so they would be pleased with us. Times changed.. Thanks to those memories .. I never let my kids feel that way. They know how much they are loved by me and I make it a point to tell them now and again. No tantrums here and I also make sure that they do not feel discriminated. I am very lucky to have wonderful kids who love each other and help me make decisions though my parents were not so lucky. I am not sure how could deal with a girl like me. Hi Farila, I missed you! I agree with Being me. At least you asked. You are very lucky having your wonderful kids. Hope that all's well with you and yours. every person has insecurities and the fear of not being loved...a child and an adult...that is why demonstration of love is good...it reassures. childhood can be so frustrating...a simple thing like a chapati can get one all worked up...wonderful post...you brought out a very important point here. 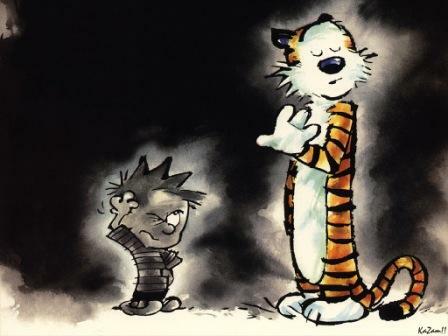 The picture you use of Calvin and Hobbes, is it yours? I am writing an exam on solving conflicts, and it would be the perfect front-page picture. Would it be possible to use it if we give honours to the artist?